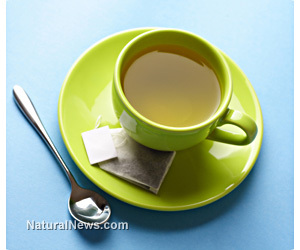 (NaturalNews) The scientific evidence in support of the cancer-fighting benefits of consuming green tea and standardized extracts of green tea polyphenols is overwhelming. The ancient Chinese have known the healing properties of sipping green tea for several millennia, while western nutrition science has been much slower to hail green tea as a powerful protective agent in preventing breast and prostate cancers. Undoubtedly, if Big Pharma could figure out how to patent the natural phenols released by consuming green tea, they would have their next multi-billion dollar superstar, and one that was actually effective in fighting cancer. Fortunately, green tea cannot be patented, and the benefits of drinking several cups of fresh brewed green tea are as close as your kitchen cabinet. Researchers have presented the results from two studies to the AACR International Conference on Frontiers in Cancer Prevention Research that explains the specific mechanism of action exhibited by green tea consumption to inhibit vascular endothelial growth factor and hepatocyte growth factor, both of which promote tumor cell growth, migration and invasion. Lead study author, Dr. Suzanne Henning commented "Our study showed that drinking six cups of green tea affected biomarkers in prostate tissue... this research offers new insights into the mechanisms by which green tea consumption may reduce the risk for prostate cancer by opposing processes such as inflammation, which are associated with prostate cancer growth." The team assembled a cohort of 67 men with prostate cancer to determine the effects of green tea consumption. Researchers randomly assigned the men to either six cups of brewed green tea or water daily for three to eight weeks. They then collected blood and urine samples before and after supplementation to test for serum prostate-specific antigen (PSA) concentrations. The scientists found that PSA levels were significantly lower at the end of the study compared with baseline levels in men consuming green tea. In a separate research body conducted at the Columbia University Medical Center, scientists assembled 40 women who were randomly assigned to receive 400 mg, 600 mg or 800 mg of a standardized green tea extract or a placebo twice daily for six months, and collected blood and urine samples at three intervals. Women assigned to receive the extract had an average 10-fold increase in green tea metabolites compared with placebo. In addition, they had a significant reduction in hepatocyte growth factor (a measure of tumor cell growth, migration and invasion) levels at two months compared with women assigned to placebo. Research authors concluded "We found that tea consumption was associated with reduced risk of cancers of the breast and prostate, in middle aged and older women and men who mainly consumed green tea." The results of these research works provide confirmation for drinking up to six cups of fresh brewed green tea daily or supplementing with up to 800 mg of a standardized green tea extract to protect against breast and prostate cancers.